Best chase day of the tour so far!! We started in Wichita Falls, TX and headed up to El Reno, OK where we stopped to have lunch and look at data. We were looking at a target somewhere from Woodward to Enid, with the HRRF model blowing up a bomb of a storm up somewhere in the Woodward area and storm motion to the southeast. We headed up to Fairview (right along that path we drove when following the Canton tornado on May 24th last year) and waited as the boundary went from flat cumulus, to enhanced, and soon towers were going up all over. We waited for quite a while and soon one on the updrafts got started pretty much right over us and would be the target of our attention for the next 5-6 hours. As the storm started getting organized, we headed south and east to get a better view of the storm since we couldn't see much detail being right under the base, traveling through Isabella and then down to a point northwest of Hennessee. Initially, the storm looked to be struggling but by this stop it was now a very nicely structured barber pole LP storm, twisting and turning just to our west. Not much later the storm went into a more classic mode and as we watched near O'Keene, spitting out numerous CG's east of the updraft and starting at least one and maybe two lightning induced fires in the wheat fields. Here the storm took on a look very similar to the Topeka storm of May 21st last year with great striations, a nice carousel mesocyclone, and a wall cloud producing multiple funnel clouds. Just like at Topeka, we couldn’t have been in a better spot for photos and the storm spun like crazy while we waited.... and, also like Topeka, nothing! To get back out ahead of the storm we went out on county roads which went east and then south into Kingfisher. Already the storm was starting to take on a more HP look to it and produced another big wall cloud then cycled through a number of meso-cyclones while inflow raged into the storm from our south, right over Kingfisher. Once again, though there was violent rotation at times, it never got focused enough to produce a tornado (though I believe one was reported at this time, we didn't see any evidence). We were in danger of getting cutoff so we charged south to Okarche, stopping several times along the way to observe the storm trying to wrap up several times despite the fact that it was now a big HP supercell with 4+" hail! As we headed towards Piedmont, the storm had amazing structure, with a jellyfish looking updraft as it was raining out of the base and incredible striations! 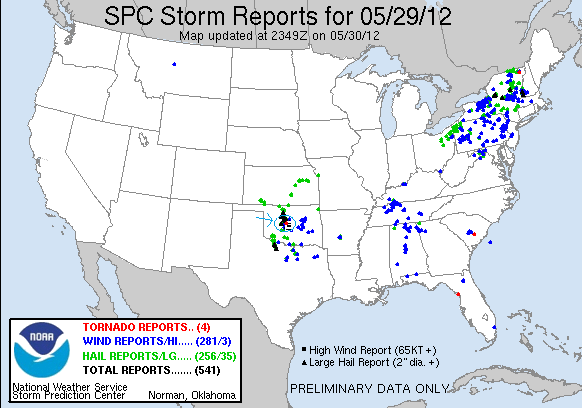 By now chaser convergence had just about maxed out with people streaming south trying to get away from the hail core. As we sat there watching the fantastic structure just to our west, the storm collided with a left moving storm and that seemed to tighten up the rotation from the storm, and quickly a bowl shape wall cloud developed and produced a rain wrapped elephant trunk tornado for about a minute! It was difficult to see clearly but it had an obvious debris fan for a few moments. Tornado number 4 of the tour. Just as fast as the cell merger tightened up the storm and caused a tornado, it killed or storm and now the entire group of cells was developing into a bow echo complex charging towards Oklahoma City, which had the tornado sirens blaring. As it started getting dark we noted that the westernmost cell on the line had an awesome liberty bell updraft, and we headed south to Mustang, then west towards Union City to intercept. As we got to Union City, we noted a massive dirt plume rising to our southwest and considered whether it might be a tornado. We passed it just as we crossed the Canadian River, and though it was reported by someone as a tornado, we don't think it was. It simply appeared to be a big RFD plume, with no apparent funnel above it or obvious strong rotation. We made it as far as Tuttle before realizing that we needed to get north very quickly to avoid getting cored in a big way and charged between two supercells north on Rt. 81 to get to I-40. As we got to Minco, we got slammed by the RFD from a supercell to our east, getting strong winds and torrential rain but not much hail luckily. We headed east and hit another big core near Yukon, again with torrential rain but no hail. As we got to the hotel, Oklahoma City was recovering from significant hail damage and we noted that some restaurant signs on our road had lights knocked out and there was very heavy hail damage to a car dealership about a mile north of us. As we settled in for the night, there are still significant power outages in town. What a fun chase day! Possibly the best structure I've seen on any storm, and it was especially gratifying to have literally been under the updraft when the storm's first tower went up all through the cycle, staying with it from LP supercell to classic supercell, on to HP supercell and finally bow echo as it lined out. It seemed like a long day, but in fact we only traveled 362.3 miles. The first storms of the day formed up near Fairview, OK, right where the HRRR model, which was very accurate all tour, predicted they would. Here we were practically right under the updraft. The guests watch the young storm develop. As the storm strenthens, it develops a "beaver tail" inflow band. Several lines of cumulus clouds form up as they are pulled into the storm. After struggling for some time, the storm gets organized and strengthens, taking on the look of a low-precipitation supercell and dropping hail on us. I got conked on the head by a nickel sized hail stone! Solid vertical updraft and anvil. The storm takes a more classic supercell look near O'Keene. The striated updraft spinning like a top! Funnel forming at the forward base of the updraft. Slightly broader view. Another storm with a monster overshooting top to our south. Awesome stack of plates updraft! Near perfect rear wall vertical updraft. Big hail core to the northeast of the updraft. Merry-go-round wall cloud forms under the draft, spinning like crazy. Wall cloud closing in. This produced several funnels part way to the ground but didn't tornado! Just like the Topeka storm from last year! The vault area of the storm directly above us. The storm cycled as we followed to the south, re-intensifying directly over Kingfisher, OK. This shot gives a great perspective of the size of these storms. The entire town of Kingfisher lies under the updraft of this monster as it cycles up another wall cloud. Yet another wall cloud produces a funnel halfway to the ground right over town. The storm never quite got organized enough to tornado and started to get a more HPish look to it. Soon the storms morphed into a big line of powerful hail storms. We scrambled southeast towards Okarche, OK, trying to stay out in front of the storm. The leading edge of the storm threatens to beat us to the road as we head southeast on Rt. 3. towards Piedmont. Now just east of the monster hail core. South of Piedmont, OK. Meanwhile, trouble for our storm, another left moving cell from the south threatens to crash into our storm! Massive hail core opens up. What a mother ship! Large bowl shaped wall cloud embedded in the precipitation core. Big inflow band spiraling around the updraft out ahead of the precipitation core. What a stack of plates!!! The southern left mover crashes into our storm, but before it kills it, the collision seemed to pinch the area of rotation in our storm and voila, instant tornado back in the precipitation core! Tornado touches down. Enhanced contrast to bring out the tornado details. Later the western most storm was tornado warned to we targeted that (meanwhile one of the cells near our original storm pounded the area around our hotel with big hail doing all kinds of damage to hotel / restaurant signs, wrecked a bunch of cards at a dealership up the road, etc. We ended just under the rotation of this storm near Union City with a huge dirt plume just at dusk but we didn't think it was a tornado. Here we are out in front of the still rotating storm at Minco, OK.